Critics say it’s time to pull the plug; supporters argue that large public transportation projects of this scale have progressed in the past without adequate funding. An infusion of $19 billion in federal funding, which would account for 40 percent of a $43 billion system, appears to be in jeopardy as Congress grapples with record deficits and scrambles to cut costs. If completed, California’s system would be the first truly high-speed rail network in the United States. Bullet trains would race down the San Joaquin Valley, linking Sacramento to San Diego and tying into the Peninsula that links San Francisco and San Jose. At the same time, a string of highly critical reports from outside panels have questioned the project’s feasibility. 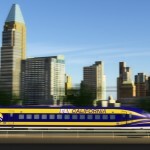 Recently, a panel reviewed the high-speed rail project and warned that it lacks a viable business plan, and urged a reassessment of cost, estimates of ridership, anticipated funding and risks before committing the state to spending billions of dollars it does not have. Federal aid, however, will be necessary for the project, which would be the nation’s first truly high-speed rail system, to be completed. Poole noted that President Obama’s call for a $53 billion, six-year investment in high-speed rail identified no funding source. Brian Stanke, co-chairman and founder of Californians for High Speed Rail, said it’s rare for a project of this scale to receive its full share of funding before getting started. He cited the BART extension to San Jose, which is proceeding without full funding. Dave, I didn’t get to listen to very much of your show today (BTW I’ve really enjoyed hearing about your trip. We made that trip, almost the same stops a few years ago and we had a blast). To the point. You had a guest today that spoke about this topic and I wanted to call so bad but I was in and out of the car and I couldn’t. One of the things that he brought up really irks me. I always hear people on the right stating that the stimulus money hasn’t helped anyone. The gentleman on your show said that the stimulus was a failure. I believe that this was in regards to stimulus money helping to pay for the train. He is wrong. Stimulus money has helped a lot of people. I see road work all the time with signs pointing out that it’s being paid with stimulus money. Stimulus money has helped the construction industry, an industry that was really hit hard by this recession. Contractors have been getting a lot of work from stimulus money. I don’t want to get into details about my business but I employee a few people and if we didn’t have jobs funded by stimulus money then we would have had to lay off our employees and I’m not sure if our business could have handled this terrible time that the country is going through. Schools have been getting stimulus money (not much but ever bit helps), Peoples Self Housing has been getting stimulus money. The stimulus has been underrated IMO. Before spending billions of dollars manufactured on a printing press, why not add two or three more daylight trains to the schedule and see if we can even fill them before adding a whole new system. I think this idea will get as far as the “bullet train” proposed between Los Angeles and Las Vegas which is nothing more than a bulldozed swath of land next to the highway. I like the idea of improving rail passenger service, but the high speed train makes no sense to me. Improving what we have sounds like a better idea. I think that California ought to improve mass transit generally before taking on a huge and questionable specific project. Instead budgets for mass transit are being reduced when the need is increasing.